Forgiveness always rests upon the one who offers it, until he sees himself as needing it no more. And thus is he returned to his real function of creating, which his forgiveness offers him again. As part of its ongoing campaign for the individual experience of Forgiveness and Peace as the only viable solution to the problems of the world, A Course In Miracles International has today launched an online giveaway of the Booklet, “The Advent of A Great Awakening”. 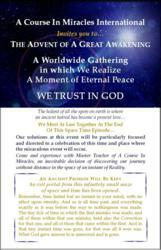 The booklet, comprising the essential teachings of Truth, was originally published in 2004 and first distributed to delegates at the Parliament of the World's Religions in Barcelona, Spain. It has since been translated into several languages and has been given to thousands of people around the world. Baron Van Verschuer continued, “In this year in which we celebrate International Forgiveness Week and Weekend of Perfect Peace, it is imperative that we remember that Peace is our natural heritage and is easily accessible by the simple act of forgiveness, or the release of our grievances. That is the only way in which we truly experience the Love that we are. As Jesus says in A Course In Miracles, 'Forgiveness is the great release from time. It is the key to learning that the past is over. Madness speaks no more. There is no other teacher and no other way. ...Forgiveness takes away what stands between your brother and yourself. It is the wish that you be joined with him, and not apart. ...Forgiveness is the answer to attack of any kind. So is attack deprived of its effects, and hate is answered in the name of love. 'Forgiveness is this world's equivalent of Heaven's justice. It translates the world of sin into a simple world, where justice can be reflected from beyond the gate behind which total lack of limits lies. Nothing in boundless love could need forgiveness. And what is charity within the world gives way to simple justice past the gate that opens into Heaven. No one forgives unless he has believed in sin, and still believes that he has much to be forgiven. Forgiveness thus becomes the means by which he learns he has done nothing to forgive. Forgiveness always rests upon the one who offers it, until he sees himself as needing it no more. And thus is he returned to his real function of creating, which his forgiveness offers him again. International Forgiveness Week and Weekend of Perfect Peace will be celebrated worldwide from Friday, September 14 through Sunday, September 23, 2012.